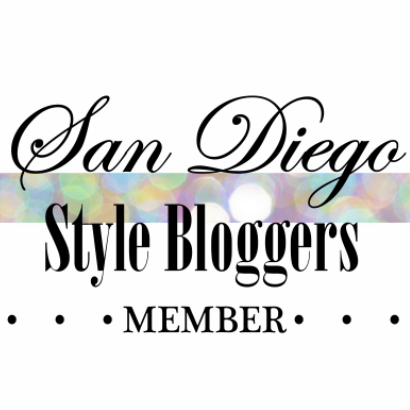 Jordan here from JJ Honey Lavender and today I'm very excited to introduce to you my new friend and fellow blogger Jerae Campbell. Recently, I was able to meet with this fabulously polished and put together lady at the Dark Horse Coffee Roasters in North Park. We met bright and early, ready to chat over our freshly brewed favorites; a coconut milk spiced chai for her and Guatemala pour over for me. Without any further adieu, I'll jump right into what I learned about this curvy fashion loving gal. What inspires you and where do you like to look for inspiration? Jerae mentioned that she likes to find inspiration through daily moments along with the occasional celebrity. Adding a personal spin and dressing her curves is something she loves to play around with when recreating a celebrity look. A few magazines Jerae finds inspiration through include People's Mag and Style Watch. I must agree, both are awesome for outfit inspo. Some of her online favorites are ASOS and Forever 21 plus. 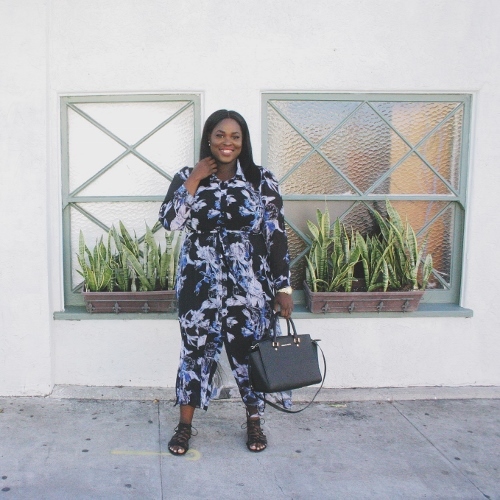 With so few plus size resources to turn to, Jerae wants to inspire curvy women and share styling tips through her looks. She hopes that her personal research into plus size brands can be used and shared by women all over the world; women who may be struggling with similar styling issues. Who are your role models in your life and why? Her mother has always been her biggest role model. Her bold yet pulled together look is something Jerae enjoys the most. She told us her mom even rocks a bald head! Which, let's face it ladies, that's a statement in itself. I have always wondered, with stylish family members, is there any family heirlooms that you own or are looking to inherit down the road? A sterling silver ring, she responds, with a three tiered band inlaid with green gemstones, currently her mother's. It is the one item she covets and hopes to one day inherit herself. Passed down from one generation to another, Jerae finds pride in being the third woman to own it. What is your makeup and hair routine like and what products do you like to use? She absolutely loves the body blender from Sephora. It is similar to the beauty blender tool but, in comparison, the body blender is bigger and provides the perfect amount of coverage when blending foundation. Her go-to foundation product? MAC's moisturizing skin finish, a hydrating product with flawless finish. She swears by Eucerin lotion for her dry skin, which is incredibly helpful during the dry winter season. Jerae also opened up about the secret to her perfect hair. After a horrible braiding session, which included her hairstylist pulling out her hair, she took matters into her own hands. She now makes her own wigs! This girl is creative and crafty. Jerae appreciates the fluidity wigs allow in being able to switch between looks based on her moods. What's a hidden quirk you can share about yourself? She loves the Golden Girls! Admittedly, she told me she owns the whole boxed set but, feels no shame. In regards to your childhood and upbringing, what are some things that have inspired your style? Having had to wear a school uniform daily, Jerae noticed that she found a sense of freedom through her personal style. In the 9th grade she made earrings that everybody loved. They were popular among classmates, friends and family. So much so, that eventually people wanted to purchase them. She also made color coordinated t-shirts for her favorite pair of Nike Jordan's. Nowadays, she doesn't feel the need to match her outfits - that's definitely a 90's trend, if you ask me. What are your plans in fashion? Jerae is enthusiastic about styling friends and family. She shared that her goal is to work on styling more people, virtually and through her social media platforms. That's not all though. This busy fashionista will be starting a Youtube channel very soon! Check it out - Curvyology: The Study of Being Curvy & Fabulous. "Never stress about something you can't change in 5 minutes."